One of the perpetual selling points of of the ‘stick bike’ highracer is that it has a straighter, more efficient chainline than a bendy European frame. When reviewing the 700C Bacchetta Corsa recently, I made the observation that it seemed to have a more twisted chain than the Nazca Fuego, based on my side-on comparison shots. Actually, I don’t believe that there’s a significant drag involved in any single idler system relative to the major choices like seat-BB delta, seat recline, stiffness and so on, and especially not compared to the use of chain tubes – but the suggestion that this plank of received wisdom might not be correct intrigued me. Here’s a side-on shot of the Corsa. I’ve used different coloured ‘chalk’ to mark the two angles being measured, which are from the BB axle to the rear axle via the surface of the power idler. Why the axles? Mainly for ease of measurement, but also because it avoids any question of favouritism (as the Gaucho has a smaller road-type rear cassette, it will otherwise look ‘better than it is’). 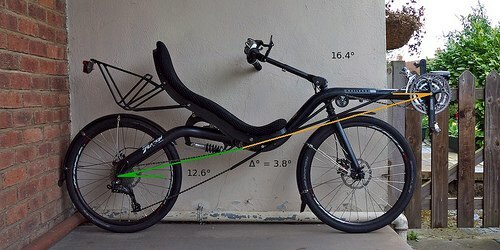 Strictly speaking this will introduce some inaccuracy between bikes, as the different distances between idler and BB axle / rear axle will mean that a 52t big ring is actually ‘larger’ on a small frame than a stretched out one, in terms of the angle. I don’t think this error is significant in terms of real world riding, of course. Why not the axle of the power idler? Well, here I thought each manufacturer may provide their own kit (as opposed to a cassette or chainrings, which are generic) – for example, Nazca now supply a neat in-house toothed power idler, although it’s not actually fitted to this Gaucho. As you can see, things are looking good for the “inefficient” Euro chainline, which is actually straighter than the stick bike by almost 3°. (Actually I hope you’re thinking, “As any fule kno, a change of angle of a few degrees is not going to make any real-life difference anyway!”, but I digress). Fortunately the air shock on the Gaucho has an o-ring which shows the maximum compression of the biggest impact it’s had riding around central Edinburgh. So, if the Dutch bike was hitting a pothole and you were simultaneously trying to apply maximum power to gap the group and start a heroic solo breakaway, it would potentially be 4.5° worse an angle across the power idler than the Corsa. Probably somewhere right about the angle of the Corsa then! As I said in the introduction, I don’t think this is something that you should worry about, unless perhaps you’re regularly placing highly in events, and a few seconds over the course of a crit or a few watts in the final max-effort sprint for the line is going to make or break you. But there you go. Stick bike chainline is not necessarily as good as an s-shaped Euro frame, even if you are obsessed with chainline instead the important things like handling and aerodynamics. If you’re interested in other thoughts on stick bikes versus ‘Euro’ frames, click here. That’s why Carbent is faster then the B bike. It has less chain deflection. It really just depends where the idler is, compared to the bb and the rear wheel axle. but still people refer to it as lively (me included) and don’t notice any power loss cause of the fwd, even on the contrary. Aha, forgot the “;)” emoticon behind the Carbent statement Great article btw! I think that the biggest problem is not in how the chain is straight or not. A bigger problem is the triangle, which is among pulley, chainring and how the frame is bended and how stiff it is. Than, when you pedal, the frame tends to bend too to get the distance between pulley and chainring shorter. And you loose power in bending the frame. The same can happen in the rear part of the frame between pulley and cassette. In oposite, the stick bikes has not such a problem. I think there is much bigger power loose in that than in “not straightness” of the chain. And the Challenge is a good example. Try to brake and push the pedal and see from side, how the frame is flexing. Seiran. It is comfy but not so efficient. 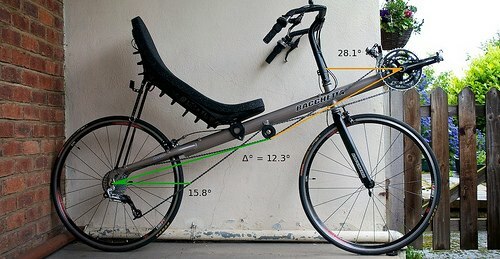 I agree there are much more important issues than frictional losses across the idler – as you say, there’s general frame stiffness – but also how reclined the seat is, extra parts (such as the handlebars or luggage) that are in the airflow, and the delta to the bottom bracket. Needless to say the Corsa is a faster bike than the Furai – but not because it has a less complex chainline, which is what surprised me and I wanted to cover here. My solution to the problem is simply: remove the idlers altogether! I have both an AZUB Max which I bought from Honza (see above), and a Challenge Seiran. They have a similar layout; 2*26″ wheels, frame suspension in the middle, stiff front forks and tiller bars, and feel more or less the same. The Seiran is a lightweight modification with carbon boom etc.. On both bikes I removed the idlers and the feel improved vastly! The chainline now runs straight through the central pivot on all but the granny gears. When using idlers, you will have the chainline offset from the pivot point, which will create a resulting force inducing flex in the frame-joint. They feel very stiff when accelerating, and only on the small 24T chainrings there is any “pogo”-feel. This is no problem considering how little time I use these gears. I use short chaintubes, to keep the chain in place, and for protecting both me from oil and the chain from the weather. So, what about friction? Sure, if you spin the crank backwards, you feel a small amount of friction from the chain tubes. Bet the important thing to keep in mind is that there is no sideways load from the chain on the tubes! Consequently it won’t get worse when you apply pressure on the pedals. Friction losses from the idlers on the other hand, will increase as you push the pedals harder. This is especially true if you have plain-faced or rubber coated idlers (in contrast to idlers with cogs) as they will make the chain bounce up and down with every chainlink. This is what gives the raw feeling when using idlers. Stick bike vs Euro bent? 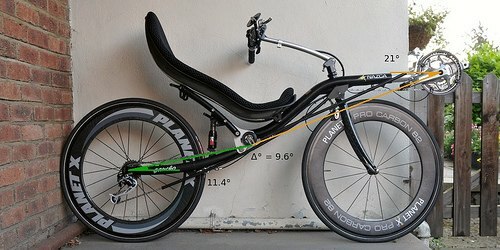 What about the classics kingcycle or aeroproject? Those are very european sticks. Am I right?